Luke 12:2 For there is nothing covered, that shall not be revealed; neither hid, that shall not be known. (3) Therefore whatsoever ye have spoken in darkness shall be heard in the light; and that which ye have spoken in the ear in closets shall be proclaimed upon the housetops. In installment (1), I described the events that lead to the discovery of the “Monster in the Closet”. 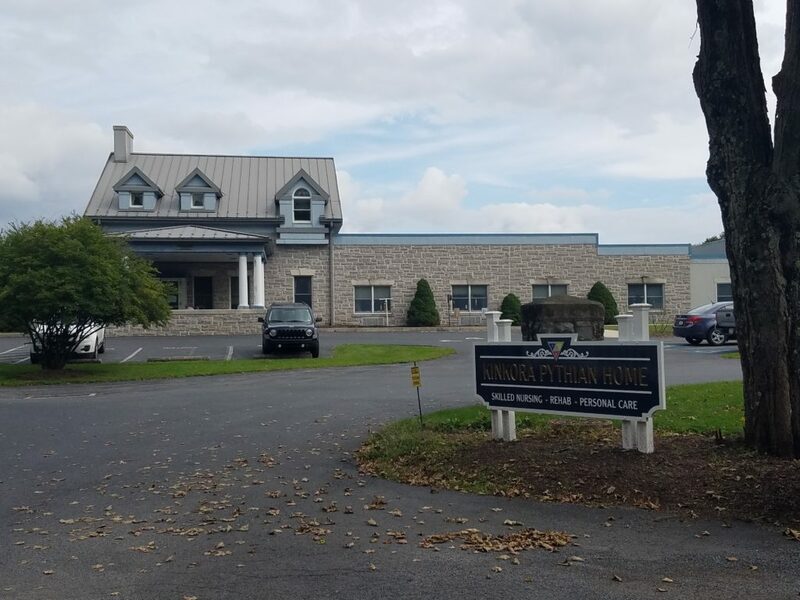 Installment (2) “The Incident” at Kinkora Pythian nursing home revealed how the “Monster” lead to my working with national organizations to stop the abuse of the elderly. The person reporting this is John R. Holman. It is important to set the stage for following installments by posting the efforts I made to resolve this issue. The Facebook posts of “Confessions of Offenses” against the elderly and myself by Kinkora employees and a spouse of an employee while the two “Letters of Condemnation” were sent to me by Kinkora Pythian nursing home’s attorney. These are hard evidence of both the elderly’s and my rights being violated. In order to resolve this issue, I attempted to contact Mr. Gerald Deitch, Supreme Chancellor, Knights of Pythias which oversees Kinkora Pythian nursing home. I sent a letter to Mr. Deitch explaining the situation. He never responded. I called Willi who refused to take my complaint. She referred me to State Representative Mark Keller’s office. By refusing my complaint, Willi violated state and federal law which I cite at the end of this posting. Keller represents the residents that live at Kinkora Pythian Nursing home. When I called Keller’s office and explained the situation they were angry that the (AAA) was not doing their job again. This shows that Keller was aware there was a problem and (AAA) was not functioning according to the law. Keller’s staff said they would make Keller aware of the situation. After several conversations with Keller’s staff in New Bloomfield, and no call backs, Keller offered to call me at my home at the date and time of my choice. I waited for Keller to call at the appointed time, however no call ever came. Keller had also promised an e-mail regarding his opinion about this matter. No e-mail came. I visited Keller’s New Bloomfield office to express my dissatisfaction with his service. I told his staff, “this is the worst service I have ever experienced by any elected official and would do everything I could to make sure he was not reelected.” His staff responded by calling law enforcement to have me removed prior to my ending my conversation. I waited for law enforcement as I did not want to have these staff members mischaracterize my visit. When the sheriff arrived I explained the situation and he left. I finished my conversation with the staff and left. Keller had me barred from his office. On July 29, I received a letter from Keller concerning his investigation about the matter. His letter contained nothing but nonsense. 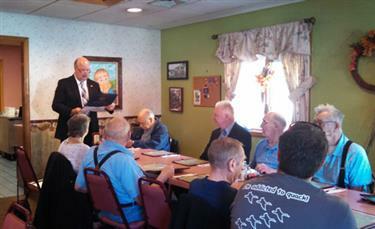 Rep Keller with vets at Kinkora! “On Monday, it was my privilege to recognize the service of eight veterans who live at the Kinkora Pythian Home… We gathered at the Ranch House Restaurant, where I presented each of them with a certificate of appreciation and a veteran flag pin. Honoring our local vets is one of the most rewarding parts of my job as a state representative.” During his visit to Kinkora, Keller totally ignored the plight of his constituents being abused at Kinkora. 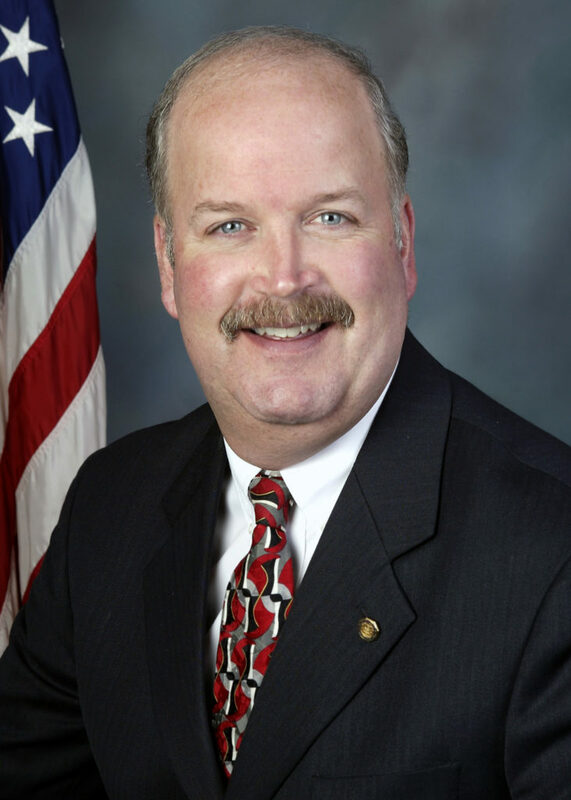 Keller does not deserve to serve in any elected position. State Senator Rob Teplitz: I spoke to Teplitz staff members. Nothing was done. U.S. Senator, Pat Toomey. His staff never replied to my contact. Representative Lou Barletta: I spoke with a female staff member. She suggested I call Kinkora and speak to one of the residents involved as this was my right and the residents’ rights to receive phone calls. I called and spoke to one of my friends. During the conversation my friend requested my wife and I visit. It appears Kinkora staff was eavesdropping on the call. An employee took the phone from my friend and asked who I was. She identified herself as LPN Mary Mertz. I asked her to put my friend back on the phone. I began to speak to my friend again and then Evan Keogh the nursing supervisor took that phone from my friend, and told me that I was not permitted communication with residents. He said my wife and had received a letter from Kinkora’s Attorney regarding contacting the residents and hung up. 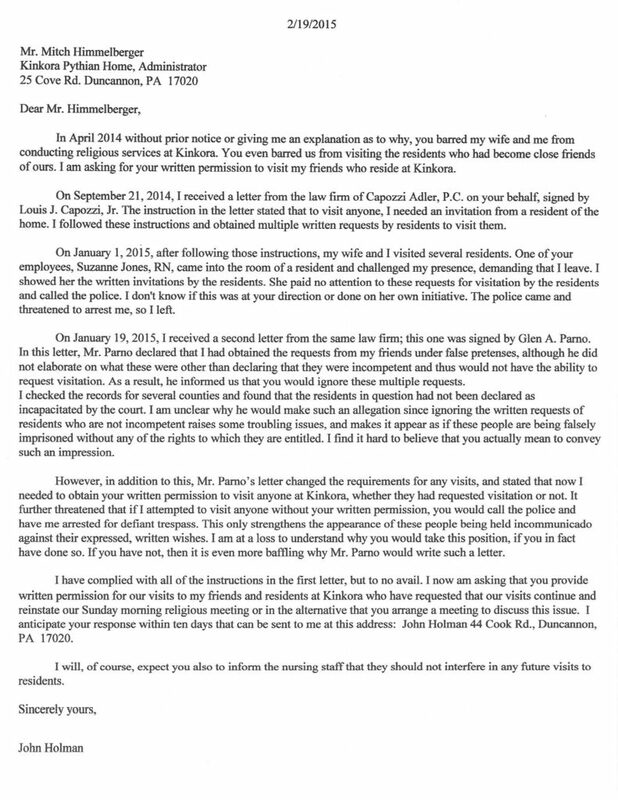 We did not receive a letter from Kinkora’s Attorney until 9/20/2014. Kinkora staff violated the almost every law regarding residents rights. I received a final telephone call from the staff member stating that the congressman’s office had overreached their authority and could do no more. Without exception officials tried to avoid the issue of the residents rights being violated by diverting the issue to my rights. I made posts on FaceBook about what was happening at Kinkora. Several employees responded or people with knowledge of what happened. They all said I was removed from Kinkora because of my religious beliefs and preaching. They exaggerated what I was preaching. I had an excellent relationship with about 30 residents of Kinkora and not one ever complained about me. No one from Kinkora ever reported a complaint from a resident, but it appears it was the staff, who especially took offense when I mentioned pro life issues. I think speaking about babies in the womb was the issue that caused my removal. My response: Toland used hot button words like “burning in hell” and “homosexuality” to attack me. I never spoke about homosexuality and my goal was to exalt the Lord Jesus and prepare the elderly to be with him. She knows religion was the issue and notice how she attacks the mental state of elderly. She appears to be someone who would eagerly go along with the violation of their rights and she worked at Kinkora! Wow, I left Kinkora over a year ago and you weren’t allowed in then and you are still trying?! John Holman, my life doesn’t revolve around facebook, so if you could give me time to answer your questions before you throw more at me, that would be great. It’s absolutely none of your concern what has been said between Mitch and I. The administration wanted you out because of what you preached, which they so clearly explained to you on numerous occassions. My response: It seems the employees knew why Himmelberger wanted me out, but no one ever told me. It was over the religious beliefs of both the residents and me because the residents agreed with me. I received two letters from the law firm of Capozzi Adler, law firm. These letters placed restrictions on me visiting the residents at Kinkora. According to law, Kinkora has no right to set limitations on the rights of residents without legal cause. These are written proof of the violation of the residents’ federal and states rights and thus condemn those who abuse these rights! The first letter dated September 18, 2014. I believe that Kinkora has no legal right to require me to obtain written permission from my friends to visit them, nor does Kinkora Administrator Himmelberger have the authority to grant me permission to visit them. The elderly are residents and not prisoners. This is a violation of my rights and the rights of the residents. Even though Kinkora had no right to require me to obtain permission to visit my friends, I followed the instructions of the letter and obtained written requests for visits from my friends at Kinkora. On January 1, 2015, I visited my friends and took the signed written requests with me. Nurse Suzanne Jones confronted me, and I provided her with copies of the written requests for visiting. She ignored the requests and actually came into the room and attempted to interfere with my visits. It appears she called the Penn Township police to have me removed from Kinkora. A police officer arrived and told me I had no right to be in Kinkora, and if I did not leave he would arrest me. Based on his threat of arrest, I left Kinkora. The Second letter dated January 16, 2015. 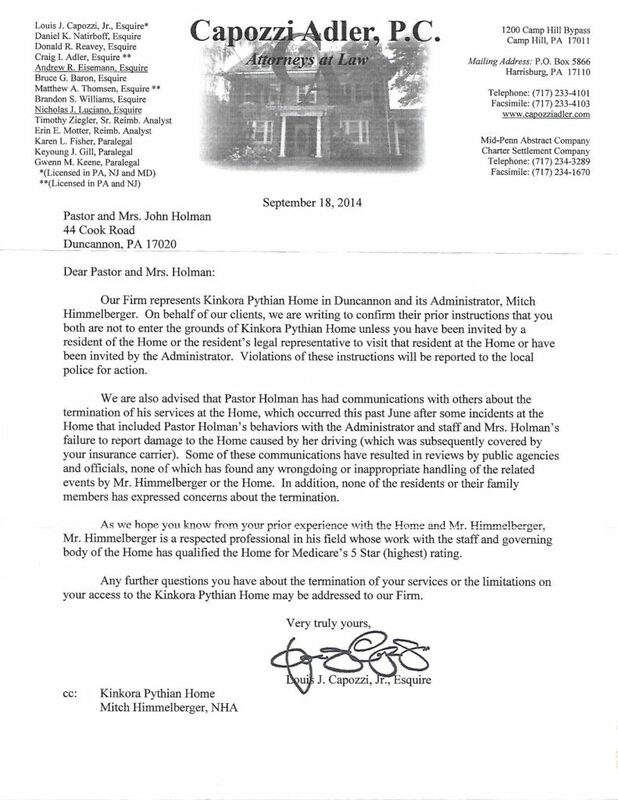 “ … By letter dated September 18, 2014, you were instructed not to enter the grounds of Kinkora Pythian Home unless first invited by a resident of the Home, a resident’s legal representative or the Administrator. On January 1, 2015, you knowingly violated these instructions by appearing at the Kinkora Pythian Home under the false pretense that you had been invited by several residents. In fact, you had not received consent to visit the Home by any competent resident. Furthermore, it appears that you improperly obtained written consent to visit the Home from several incompetent residents. A search of both Perry and Cumberland County court records found that only one resident that I visited was declared by the court as “Incapacitated”. I know of no legal term of “incompetent”. Attorney Parno is declaring all these residents “incompetent”, and therefore unable to choose who their quests are and exercise their religious freedom. I know of no law that allows Attorney Parno and this law firm to strip the residents of Kinkora Pythian Home of their rights like this. This is a serious violation of both federal and state law, and they put it in writing! I was visiting residents with their written permission, which I have a lawful right to do. Nurse Suzanne Jones, RN, made a disturbance in the hallway as we were walking to the room of my friend which upset many of the residents. Nurse Jones or Administrator Himmelberger then called the police, who confronted me as I walked out from my friend’s room. I spoke with the officer about the residents, rights, but he said that this did not matter, and on instructions from Kinkora he would arrest me if I did not immediately leave. Parno’s letter continued in bold and underlined: Accordingly, you are hereby notified that you are strictly prohibited from entering the Kinkora Pythian Home property under any circumstances unless you first requested and obtained written approval of the Administrator. 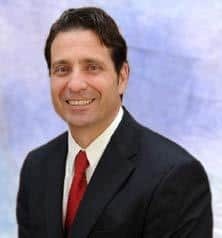 After Attorney Parno declared the residents incompetent, he then states that only Administrator Himmelberger, through written permission, can grant the right to visit the residents. This is total control by Himmelberger, who now it appears is declared the resident’s guardian! 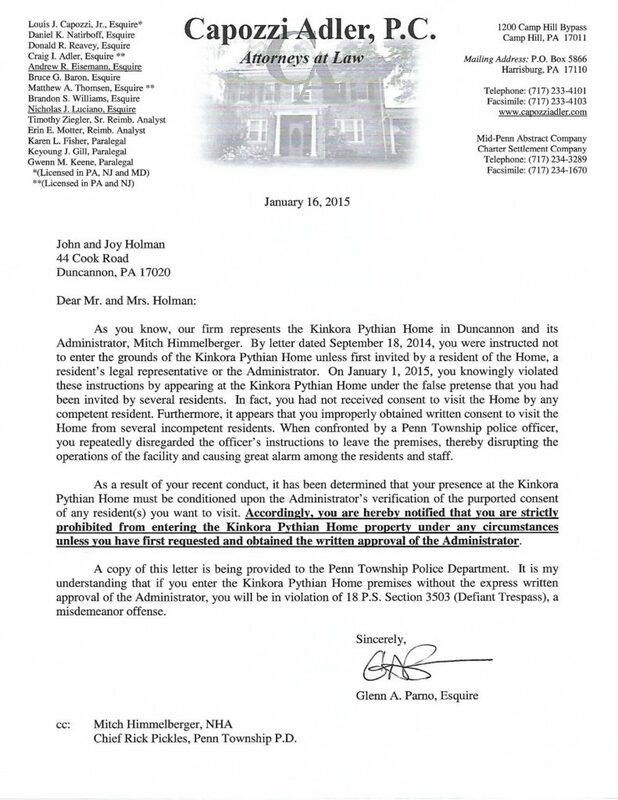 By this letter Himmelberger seems to be acting more like a prison warden then nursing home administrator! The problem with this, the residents already declared both orally and in writing that they want me to visit, and both Attorney Parno and Himmelberger are overriding their rights! This is a serious violation of the residents’ rights, and they put it in writing! Although the letter states that I need Himmelberger’s written request is illegal, I complied with this requirement. Himmelberger was hand delivered a letter dated Feburary 19, 2015, with my request for his written permission for me to visit. Himmelberger failed to respond to my request. A copy of this letter follows. Attorney Parno closed the letter by threatening me with arrest under 18 P.S. Section 3503 (Defiant Trespass) a misdemeanor, if I entered the Kinkora property. I believe the lie in this letter was an attempt to have me arrested under false pretenses which is a misdemeanor offense in Pennsylvania. 42 CFR 483.10 – Resident rights. (4) The resident has a right to receive visitors of his or her choosing at the time of his or her choosing, subject to the resident’s right to deny visitation when applicable, and in a manner that does not impose on the rights of another resident. (b) Exercise of rights. The resident has the right to exercise his or her rights as a resident of the facility and as a citizen or resident of the United States. (1) The facility must ensure that the resident can exercise his or her rights without interference, coercion, discrimination, or reprisal from the facility. (2) The resident has the right to be free of interference, coercion, discrimination, and reprisal from the facility in exercising his or her rights and to be supported by the facility in the exercise of his or her rights as required under this subpart. (6) The resident has the right to have reasonable access to the use of a telephone, including TTY and TDD services, and a place in the facility where calls can be made without being overheard. This includes the right to retain and use a cellular phone at the resident’s own expense. (8) The resident has a right to participate in other activities, including social, religious, and community activities that do not interfere with the rights of other residents in the facility. Section. 712. State long-term Care OMBUDSMAN PROGRAM. This ADP requires Pennsylvania’s Department of Aging to conform with The OLDER AMERICANS ACT and all other federal law. A complaint is a concern made by or on behalf of older individuals who are consumers of long-term care services relating to action, inaction, or decisions of providers or their representatives, of long-term care services, of public agencies, or of health and social service agencies, which may adversely affect the health, safety, welfare, or rights of such consumers including the appointment and activities of a guardian or representative payee. Complainants shall be encouraged to attempt self-resolution prior to intervention by the Ombudsman. All complaints, including those from anonymous sources, shall be investigated or referred for investigation where the complaint involves areas beyond the scope of the Ombudsman program. However, all activity involved in the complaint process shall cease immediately if the complainant/older individual withdraws the complaint. If the Ombudsman finds that other older individuals may be in jeopardy or may benefit from intervention based on the information obtained, the Ombudsman may proceed as the complainant while maintaining confidentiality of the source. (i) The resident shall be encouraged and assisted throughout the period of stay to exercise rights as a resident and as a citizen and may voice grievances…. Pennsylvania law declares in that only a court can adjudicate a person incapacitated. (1) When the resident is adjudicated incapacitated by a court. Kinkora staff violated almost every state and federal law regarding residents rights. I have never met Kinkora Administrator Mitch Himmelberger in person. 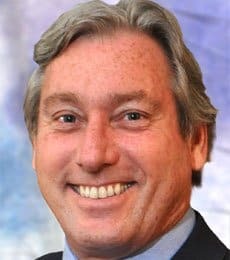 Himmelberger, nor his law firm, nor anyone working for Kinkora ever gave me a legitimate cause or reason why I am barred from visiting my friends. In the next installment, we will provide the evidence of what happened when I pursued the Penn Township Police for a copy of the incident report on January 1, 2015, when I was forced to leave Kinkora. You don’t want to miss this. Wait until you see the next post and how deep the corruption is. In the work I do,most of my customers are elderly,or at least older than myself.I believe the Lord has placed me in their lives at this point to,[like you],make sure they know the real Jesus before they pass off the scene.Unfortunately,satan is busy too,trying to keep them from hearing the truth.I will continue to pray that the walls blocking you in your ministry to them will fall down.They need to hear a clear presentation of Christ,It may be the first or last time for them to hear about Jesus and His power to save.God bless you John in your efforts to see that Heaven will be their final home.Lord God..please clear the way for brother John to minister to Your flock,Amen. kidnapping on medical grounds is an even more lawless area. be too late for them and they ” will weep and gnash their teeth ” when they are hell and there is no way out – forever .